An NIBIB project is using edge servers and PHRs to Replace CDs. It could be a look at the future of image and record sharing. Transporting images and medical records on CDs once seemed like the height of convenience, but it has turned out to be a bit of a hassle for many imaging facilities. Computer viruses, discs that launch their own viewers, and a lack of formatting standards have provided ample evidence to prove the law of unintended consequences. Multiply those issues by hundreds of thousands of patients across the country, and it becomes clear why importing CDs is eating a growing chunk of manpower in many medical facilities. A project currently under way may provide a new model for exchanging patient records. It doesn’t use CDs to transport patient records—in fact, it doesn’t use any physical media at all. What it does use is free, open-source computer code to build a framework for sending patient records from hospitals to personal health records (PHRs). From that point on, the patients are in complete control; they can direct their PHR to distribute the records however they see fit, and they don’t need physical copies to send their records where they want to go. The device that accomplishes this task is called an edge server. It’s the result of a contract from the National Institute of Biomedical Imaging and Bioengineering (NIBIB) that was obtained by a consortium of participating medical centers through RSNA. The project is being conducted among five sites geographically spread across the country: Mount Sinai Hospital in New York, the University of Maryland, the University of Chicago, the Mayo Clinic in Rochester, Minn., and the University of California, San Francisco (UCSF). 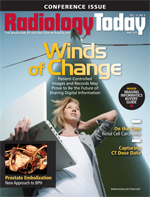 “As opposed to other health image exchanges across the country, which are often very local activities, we’re really trying to put in place a platform that is a model that can be extended in the long term and spun off as a national imaging exchange,” says David S. Mendelson, MD, FACR, a professor of radiology and chief of clinical informatics at Mount Sinai Medical Center, who is the principal investigator at Mount Sinai and for the overall project. One of the project’s goals is to demonstrate that different developers with different philosophies can bridge the image-sharing gap. To that end, Mount Sinai is coordinating the development of the edge server, and each of the other sites is developing components for it. Although there is a lot of optimism surrounding the project, there is still a great deal of work to be done. Rather than allow direct contact between institutions, the project relies on the edge server, a clearinghouse (a database that’s considered neutral ground), and PHRs to provide security and confidentiality. The patient encounter begins at a Web user interface. When a patient has an imaging exam, he or she can sign up for the program. The patient is assigned an edge server ID number—called a token—and a PIN, and the images and accompanying report are pulled from the PACS and RIS, respectively. The clearinghouse then waits to receive a request from a PHR. The likely PHR participants as of this writing are FrontRad Technologies, Microsoft HealthVault in conjunction with lifeIMAGE, and InSite One, which was bought by Dell in December 2010. Using the PIN and token, which are assigned to the specific request rather than the patient, the patient can instruct the PHR to retrieve the information from the clearinghouse, which is being administered by lifeIMAGE. Once the information is in the PHR, the hospital is out of the loop, and the patient can control how the information is shared. The entire series of transactions is guided by the free, open-source IHE (Integrating the Healthcare Enterprise) XDS-I.b standard, which is important because a key goal of the project is to demonstrate the viability of lower-cost alternatives to proprietary image-sharing solutions. But modifying XDS-I.b for the planned volume of images presented some challenges. While the technological details have largely been hammered out, there are several legal and business hurdles that need to be cleared before the edge server can begin operating. The first is HIPAA compliance. Because this is a new workflow, the institutions want to be certain they’re meeting HIPAA requirements. Some HIPAA issues are still being addressed. The institutions are also working to satisfy their own institutional review boards (IRBs). IRBs often set additional privacy requirements beyond HIPAA’s requirements. Without IRB approval, the institutions would have no access to the patient data, which means they wouldn’t be able to study it. But the IRB issues can’t be addressed until the HIPAA issues are settled. There are also business associate agreements (BAAs) that need to be signed; however, determining who needs to sign off is an inexact science. Typically in a situation like this, all the hospitals would have to sign BAAs with each other; but if this business model is going to set a precedent for other image-sharing initiatives, a multitude of BAAs will quickly become impractical. The answer may be for each hospital to sign a BAA with just the clearinghouse, but that remains an open question. To date, Mount Sinai is the only institution that has received all the necessary approvals to begin operation of the edge server. The sites hope to be online this spring. Avrin says the business-to-business aspect of the project is important for the entire medical enterprise, not just radiology. He says one challenge related to sharing medical information is that hospitals tend to view patient information as business assets. He adds that the United States is the only major industrialized nation that doesn’t have a national medical record identifier, which he sees as a significant flaw in the system. This demonstration project has the potential to be a step toward better collaboration among medical institutions. But even after the legal issues are settled, and there’s no reason to believe they won’t be, there is one more question that needs to be answered: If you build it, will they come? The success of the project hinges on persuading patients to participate. Paul J. Chang, MD, FSIIM, a professor of radiology and vice chair of radiology informatics at the University of Chicago and principal investigator at the Chicago site, says patients may be reluctant to sign up for the project because of concerns about how their University of Chicago records will be handled at facilities that don’t have access to the edge server, including other hospitals in the Chicago area. He says the hospital also doesn’t want to be seen as favoring one PHR or group of PHRs over another. Chang believes the best way to deal with these issues is to be completely transparent about the process, offer patients as many options as possible, and develop a marketing strategy. Once the business arrangements are finalized, the real test of the project’s effectiveness will begin. It is set up to accommodate as many as 300,000 patient records, and each site is supposed to enroll three local competitors to test whether sharing data in this manner decreases repeat imaging. But success can be measured in different ways. Initially, it will be measured by how many patients sign up and how well it manages their information. But it may also provide an opportunity for facilities to look at their data in new ways. Although medical facilities are transitioning from paper records to digital records, the digital repositories are still organized in discrete blocs. And facilities are still constrained by having to transfer records on physical media. Siegel says easing the barriers to information sharing and creating a patient-centric record have the potential to not only eliminate physical media but also allow more effective record searches across patient records that are currently stored separately in multiple hospital and outpatient office records, potentially saving time and improving patient care. A more subtle sign of success will occur when image and data sharing are integrated into vendor offerings; the surest sign of technology integration is when it’s taken for granted. Before there were CD players in cars, there were portable CD players with tape deck adapters. Most people probably haven’t seen one of them in a long time. Chang believes meaningful use rules coupled with normal market forces will speed up the timetable for integration. Although the federal government has yet to set meaningful use guidelines for radiology, the patient-centric model of health information management is an idea that’s not going away. Sometime in the future, meaningful use will come to radiology, and this project may make that transition smoother. If nothing else, the researchers hope it will set a benchmark for future efforts.